On a small knoll, facing south across the valley, sits The Rookery, covering over two acres of woodland broken by cultivated lawns and informal gardens. A wonderful place to explore, an island of tranquillity in a dales landscape. The original country house has long since gone leaving the stable block and courtyard which have been converted into an impressive dwelling. A private drive crosses parkland meadow to an impressive arched entrance and flagged courtyard. 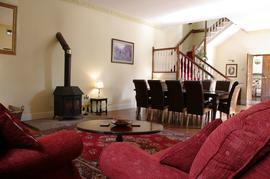 Entrance to the house opens into a spacious, well-equipped kitchen that includes an Aga stove. To one side of the kitchen is a large dining room with woodburning stove that leads through to the drawing room with a Victorian fireplace and period chandelier. 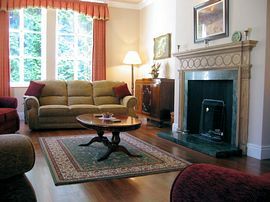 Both rooms have beautiful cornice work, polished hardwood floors and large windows bathing the rooms in warm natural light. Also off the kitchen is a utility room that leads into a games room with ¾ size pool table, dartboard, galley kitchen and bathroom. A corridor leads from the games room to the courtyard. From the dining room a wide and elegant staircase with open balustrades and polished rails rises to the main landing that serves five bedrooms, two bathrooms and a shower room. Two bedrooms have twin beds, one a double bed, one a king size bed and the other a super-king size bed that can be split into twin beds if preferred. 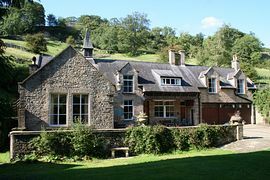 All bedrooms have large windows with views either over the courtyard to the far fells beyond or onto a rock terrace to the rear of the house and up the steep fell behind. One bathroom is en-suite to the king room, the other en-suite to the super-king room but both are also accessible from the landing. The double room, with brass bedstead, was originally a kitchen for the ostler and still contains the original Victorian kitchen range. The ceilings upstairs are vaulted into the roof space with rafters, purlins and king posts exposed in various forms adding individual character to each room. The scale and setting of the house along with its unique style enhanced by the retention of original features and enriched by period fittings, fine furnishings and soothing colours makes this an enchanting place to stay. 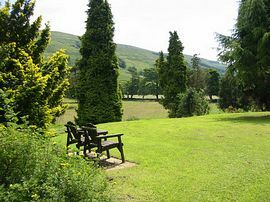 The Rookery offers very spacious accommodation, with woodland grounds and lawns that cannot be described as remote, in the true Dales tradition, but a perfect hideaway haven none the less. Spacious accommodation, with woodland grounds and lawns. Five bedrooms, three bathrooms and a shower room. Drawing room with a Victorian fireplace and period chandelier. Large dining room with woodburning stove. Double room, with brass bedstead, was originally a kitchen for the ostler and still contains the original Victorian kitchen range. 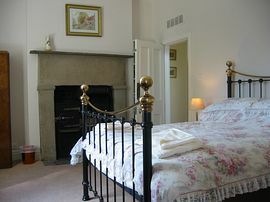 Duvets and pillows are provided with linen and towels included in the rent. Local Services: Shop 3 miles, pub 2 miles. Precise directions to the cottage will be given at time of booking. Nearest train station is at Northallerton. Prices are from: £751.00 Low season to £1333.00 High season. Mrs Leighton wrote "A wonderful escape to the country. We all enjoyed it so much. I had a fantastic 60th birthday celebration and we all enjoyed the outdoor area. We were completely at home as soon as we came through the gates. The wildlife around the grounds were very entertaining, our 2 year old granddaughter loved the rabbits and squirrel. Thanks to the owners and yourselves (Country Hideaways) for one of the best properties we've stayed in. Would like to return one day." Mrs Cooper wrote "The size, friendliness of owners and the area. The way the rooms are spread out. House very nicely furnished. Thank you very much for a most enjoyable stay." Mr Dawson wrote Home from home, every convenience. The Rookery had everything we needed and more. Came last year also."